Sure enough, before each walk in the woods he would hop first on one foot, then the other and he never saw a bear or a lion. He did this year after year, until he came to believe that what he had been taught was absolutely true. Then one day a lion came, attacked him, killed him, and ate him. The truth is that the lions and bears were busy eating other men. Reality had nothing to do with his dancing. Therefore once they had eaten all the other men, they came and ate this man also, in spite of his dancing. Reality is what it is, even if we try to dance it away. The essay on “Truth” addressed the issue of reality and our relationship to it. Simply put, anything that is not rooted in reality is fiction and make believe. Anyone who builds his life around fiction and make believe is delusional, much like the dancing man in the previous parable. A basic premise of this web-site is that it is necessary to apply the scientific method to discern truth and reality from fiction and delusion. The scientific method represents a process we all use continuously to construct an accurate understanding of reality. The heart of the process is the “reality check”, which is simply a comparison of expected result with actual result; with corrective action following any mismatch. The more rigorously and diligently we apply it, the more rooted we are in truth and the more effectively we live our lives. Is there anything the man in the woods could have done to avoid being eaten by the lions and bears? Absolutely! He could have done a reality check on his belief: He could have been on the lookout for lion tracks and bear tracks. Even if he never saw the lions, he would have known they were around if he saw the tracks. Perhaps, if he had done a reality check, he would have concluded that the dancing was useless and acted accordingly to protect himself. But he didn’t and he was eaten. We might recall the sound of the lion in the woods and update the Sensory Toolbox: Next time we’re walking in woods, we’ll be listening for those particular sounds. Perhaps we remember that our gun was unloaded and it took so long to load the gun that we were almost killed; so we update our physical toolbox: We will always walk in the woods with loaded guns. We might note that with a loaded gun we would have had plenty of time to react. We update the Analytical Toolbox accordingly: Next time we’ll take that into consideration as part of the decision-making process. A person connects to reality (Truth) through a personal Sensory Toolbox and Physical Toolbox. Unfortunately our toolboxes and minds are imperfect. Therefore our Sensory Toolbox may distort the reality it feeds us. Astigmatism and hearing loss are examples. Therefore we all receive an inaccurate perception of reality. Our Physical Toolbox may be unable to do what we want it to. For example, I may want my hand to draw a perfect circle, but I can’t do that no matter how hard I try – unless I use a compass which then becomes part of my Physical Toolbox. The Sensory Toolbox includes our five senses plus any additional tools we can use. Sight, for example, is part of the Sensory Toolbox. Some have poor eyesight and they obtain glasses to correct it. The glasses then become part of their personal sensory toolbox. Radio astronomers are searching the heavens for radio waves they cannot see, but they have developed sophisticated radio receivers to help them with this task. Those radio receivers are part of the scientists’ Sensory Toolbox. The Physical Toolbox includes all our muscles and any additional tools we can use to affect the real world. A megaphone allows a person to yell louder. A hammer allows a person to hit harder. A winch allows a person to lift heavier objects. These tools are all part of a person’s Physical Toolbox. 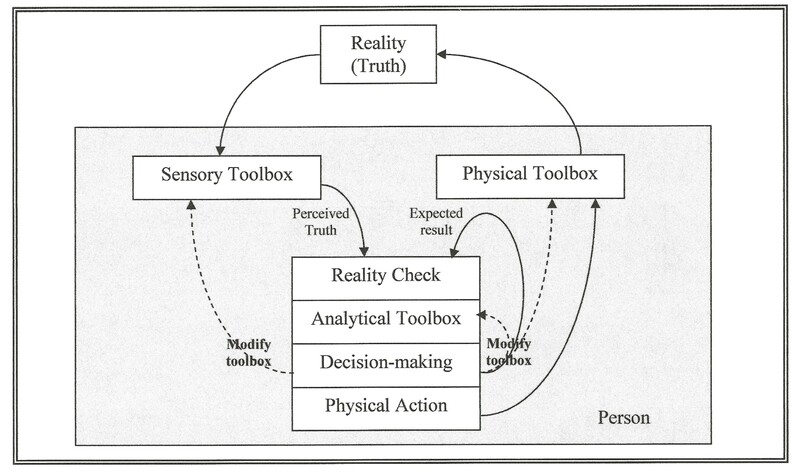 The Sensory Toolbox continuously feeds a person with perceptions of reality (Perceived truth). The mind processes this information and ultimately chooses to take some action through the Physical Toolbox, with an expected result. For example, we make a decision to lift an object. We command our hands (Physical Toolbox) to lift that object. The expected result is successfully lifting the object. If the perceived result and the expected result match, we have confirmation that our understanding and perception of reality are accurate. If the two don’t match, then we perceive an error, and initiate a process to determine the source of the error. Reality simply is; it cannot err. The error must be either in the Sensory Toolbox (misperception), the Physical Toolbox (not strong enough), the Decision-making process (incorrect paradigm, worldview, decision criteria, etc. ), or the action (e.g. disconnect between hands and brain due to illness). No two situations are identical, but we must identify and eliminate the error wherever it may be if we are to perceive the truth accurately. How is that to be done? This is where the scientific method kicks in, as illustrated by the car race example. A government agency is publishing statistics widely used for public policy decisions. The statistics are based on theoretical models that are not subjected to a Reality Check. When tested against independent sources, the statistics show significant errors. When checked for internal consistency, the data show numerous conflicts. So we waste much money where it’s not needed, and don’t spend it where it is needed. The captain of a ship is navigating by chart. He plots his position based on the ship’s speed and direction but does not periodically conduct a Reality Check with a sextant to verify his true position. The ship runs aground and many are killed. Many scientists are making dire predictions about global catastrophes like starvation or climate change using unproven analytical models, but the predictions are not periodically subjected to a rigorous Reality Check which would indicate errors in the models. So we continue to make flawed policy decisions based on flawed perceptions. Many political leaders are making life and death decisions, such as decisions regarding war, medical situations, life, etc. based on commonly accepted perceptions that have not been subjected to a rigorous Reality Check. Had they been, it would have been found that the policy decisions may actually be exacerbating problems rather than helping solve them. All is not as it looks. That’s why we must subject everything to a rigorous Reality Check, learn from the results, and seek Truth with all our heart, mind, and soul. All else pales in comparison.